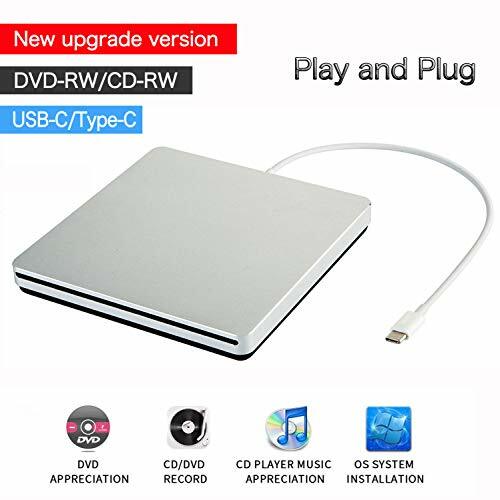 With this portable external cd dvd drive, burner, writer, you can enjoy movies, music, burn discs and more. 100% brand new high-quality DVD drive has table working performance and long service life. Beautiful all-aluminum alloy body, silver USB-C interface. System Requirements: Use for the latest MacBook Pro/MacBook which has USB Type C. Every item we provide a USB Type c(Female) to USB(Male) converter,so once you want to use for the USB port Macbook Air/Pro or other Notebook,you can use smoothly with it. You'll never have to worry about lost cables with the USB-C SuperDrive. It connects to your MacBook Pro with Retina display, MacBook with a single cable that's built into the Superdrive. 100% RISK FREE PURCHASE: VesTcp DVD Drive Features Strong Error-correcting ability,Anti-shock and Noise Reduction Technology. We Believe in the Quality of our Product that we are backing it up with a 90 days' Warranty.These will give you best customer service! If you have any questions about this product by VesTcp, contact us by completing and submitting the form below. If you are looking for a specif part number, please include it with your message.